Does your nonprofit know how many of its supporters read action alerts and fundraising appeals on their smartphone? It’s probably a lot more then you think. 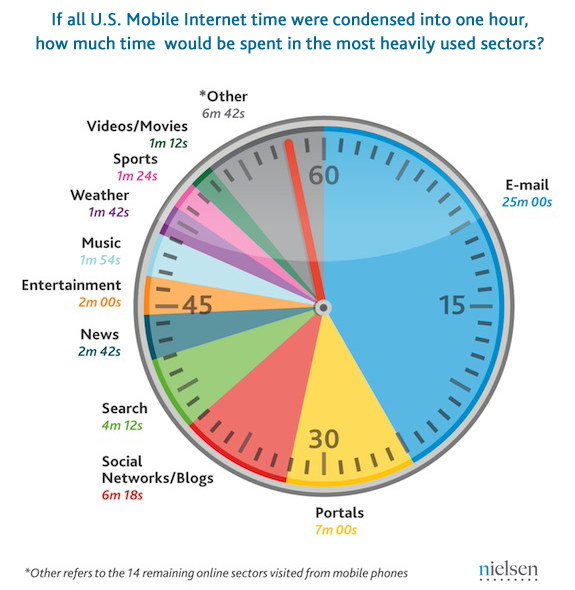 A new report by Nielsen shows that email is the number one activity people do on the mobile web. In the last year email activity on mobile devices increased from 37.4 percent to 41.6 percent. Despite some predictions, the rise of social networking hasn’t pushed email and instant messaging into obscurity, said the Nielsen report. Across online mediums, email is the third heaviest activity online. Americans spend nearly a quarter of their time online on social networking sites and blogs, up from 15.8 percent one year ago. They spend a third of their online time communicating and networking across social networks, blogs, personal email and instant messaging. Online games are the second most heavily used activity behind social networks. You should follow Frogloop on Twitter.